Last year I wrote an essay for The New York Times Motherlode blog titled “The Perfect Backpack.” You can read it here. 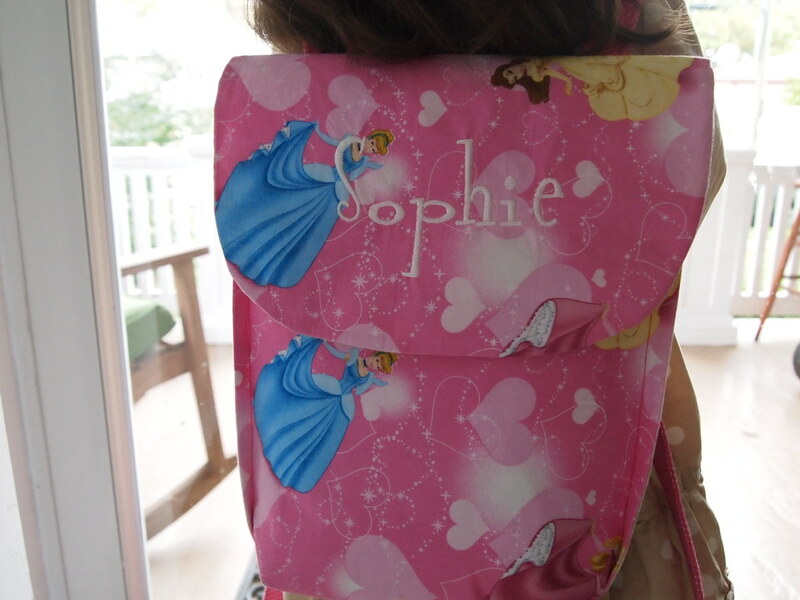 After all that, we ended up getting Sophie a new backpack this year. Two reasons: (1) Last year’s backpack was too small for a regular size piece of paper—and her preschool teachers suggested that students have bigger backpacks at this year’s orientation. 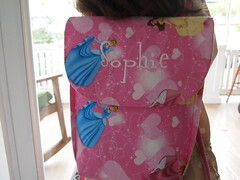 (2) Sophie’s obsessed with princesses. Disney princesses, specifically. So I asked Andy’s talented Aunt Susan to make her a new one. Sophie loves it. I do, too. It has Disney princesses on it but is still homemade. Her name is embroidered on it. 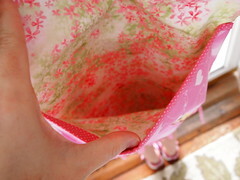 It has adjustable straps and a pocket inside. It fits regular size papers perfectly. Susan sells her work on Etsy here, and she’s very much open to custom work, such as this backpack. This entry was written by kara, posted on October 23, 2012 at 9:50 pm, filed under All and tagged backpack, Etsy, Fairy Godmother Originals, handmade, Sophie, Susan Wasmer, The New York Times. Bookmark the permalink. Follow any comments here with the RSS feed for this post. Post a comment or leave a trackback: Trackback URL.